This week's slate of releases won't match up to the surprising and stealthfully strong Martin Luther King Jr. weekend in terms of box office, but there will be a compensation. With Oscar nominations arriving today, a number of films that have been getting critical buzz - but were so far reserved for a couple of major centers - will get nationwide rollouts. But first, there's the 2009 releases to get to. Leading the way is the third film in the Underworld series, Rise of the Lycans. A prequel to the 2003 vampires and werewolves film that starred Kate Beckinsale, it purports to tell us how the feud between the two races of demons began (though as I recall, the first film actually did that anyway), with everything awash in blue filters. Beckinsale has left for greener pastures, replaced by Rhona Mitra, who as a lanky British brunette, apparently fit the costume. 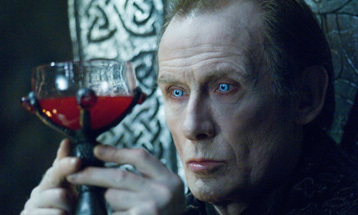 Bill Nighy, well on his way to becoming this generation's Christopher Lee, is also back, as well as Michael Sheen, who has to be thinking, "C'mon! I've been the lead in two Best Picture nominated films! How am I still doing these movies?" To add a little lemon juice to that paper cut, not only did he lose Beckinsale, the mother of his child, to the first film's director, he has to carry on her movie franchise.